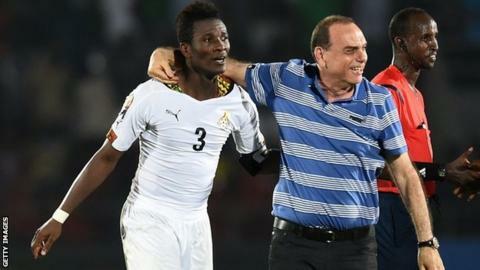 Ghana coach Avram Grant is expecting a good game with Ivory Coast in Sunday's Africa Cup of Nations Cup final. "We've seen quality players and quality football in this tournament but we can expect even more," he said. Organisers will be eager for the focus to return to football and away from the crowd trouble in Ghana's semi-final that has marred the tournament. Play was interrupted for 30 minutes towards the end of Ghana's 3-0 win over Equatorial Guinea on Thursday as the home supporters threw missiles from the stands. Ghana will seek to avenge defeat to Ivory Coast in the 1992 final - the only time the Elephants have lifted the trophy - and Grant says his side are in the right frame of mind to deliver. "They are very motivated, they do not need any speeches because we have come a long way as nobody gave us a chance. They will show this on Sunday." "The win in 1992 is a psychological advantage as Ivory Coast beat Ghana on penalties", said Renard, who was Ghana's assistant coach at the 2008 Nations Cup. However, the Frenchman dismissed the tag of favourites attached to his team. "Some people are also expecting the Black Stars to win. What people think is not important, we have to focus on our target. We know why we are here. "In my opinion, it's time (for Ivory Coast to win). We will see what happens on the night. It will be a tough game - a final between two of Africa's strongest teams. It won't be easy. "I know Ghana very well, but they also have some new players. It is better to know them very well. "If you don't know Asamoah Gyan is a good header of the ball, then you are in trouble. So, we won't be surprised by them. "But Ghana is not only Gyan. Their best player is Andre Ayew and so we have to be very careful about him."